At Little Bear Books, we use insight from nature to create products that inspire, entertain and educate the young and the young at heart. New Bilingual Bear Book With Music Download Available Now! MUSIC AND NATURE come together in sing-along stories by Little Bear Books. We combine music CDs with picture books for children in an interactive read-and-sing set. Our sing-along stories let children see, hear and participate in the action. Our songs are also available in MP3 format. AT LITTLE BEAR BOOKS we call upon the reading-singing connection to teach wildlife concepts, environmental awareness and appreciation of the natural world. We connect literature, environmental education and music in our songs and picture books for children. Rhythm, rhyme, repetition, toe-tapping tunes and imaginative illustrations all add magic to our message. 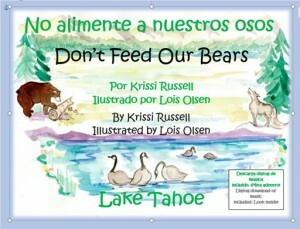 Environmental education comes alive in a Little Bear Book!